The two main protagonists. One of them will end up as a murderer at the end of the anime. Want to know who? Watch this excellent horror anime title. 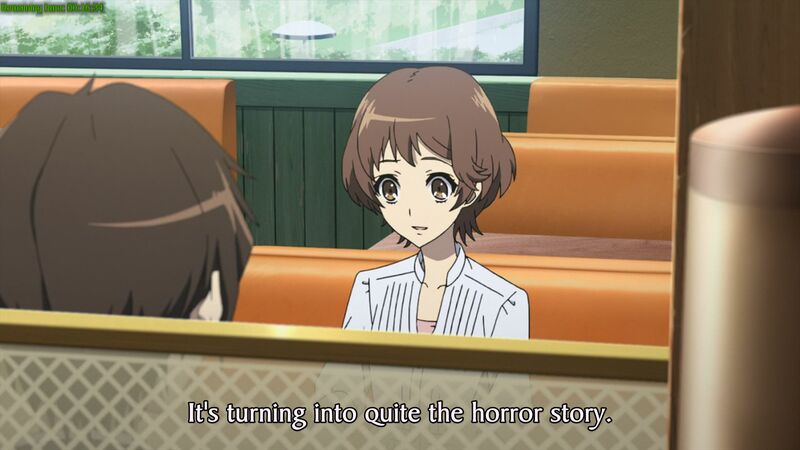 The second entry reviewed in the current ‘Anime of the Year 2012’ audition is titled Another, an anime that belongs to the poorly represented ‘supernatural-minus-superpowers’ horror genre. As far as I remember, the only other anime title I reviewed here before that is similar to this anime is Gakkou no Kaidan, and that anime is more popular for its stupendously ‘awesome’ English dub than its ‘creepy’ storyline. The Higurashi series is probably another similar title to this one, but it has too many superpowers elements in it to be considered as one. This anime is definitely better than the first entry of the audition, but is it good enough to win the audition at the end? That question will be answered eventually in the future. 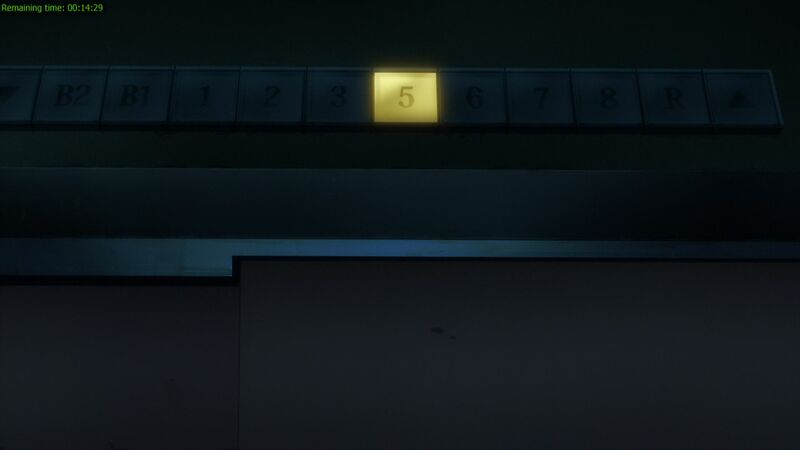 Befitting the genre this anime falls into, the hospitals in this anime also practiced skipping death numbers for their floors' numbering scheme. I've seen this in real life, but didn't really expect to see it in my anime. 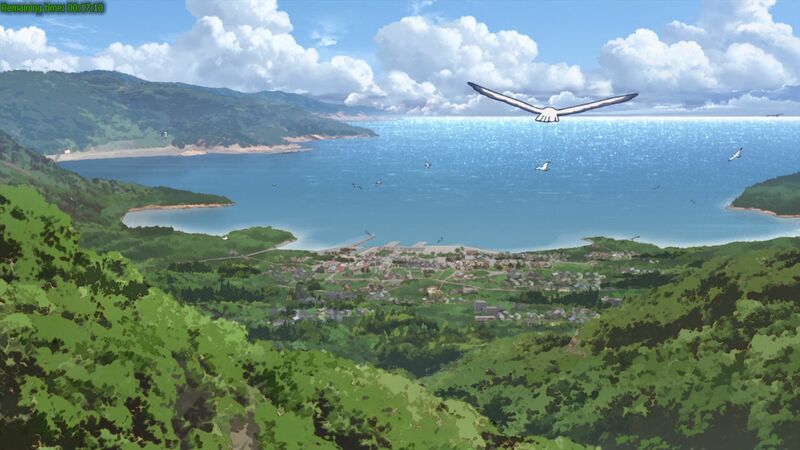 Sometime in the 90s, the main male protagonist moved from Tokyo to the rural Yomiyama because of his father’s job. But before he arrived at his new school, he has to be warded at the local hospital instead for lung collapse. At the hospital, he met the main female protagonist, and this chance encounter inadvertently caused a perennial deadly curse to start happening at the school he has not attended yet. Generally, there are no major weakness in the storyline of this story-driven anime title. While the quality isn’t exactly on par with many of the excellent non-anime horror titles from Japan, it is still quite decent. What set this anime’s storyline apart from many of those Japanese horror movies is that I didn’t get scared at all when watching this anime, but as the final episode’s end credit rolls and I jogged up my memory, I finally exclaimed, ‘Damn!’ as the story finally gets to me. There are no plotholes, and everything seems to be logically finished up at the final episode. The plot in the first four or five episodes is very predictable. This issue resolved itself though after that. The solution to stop the curse is surprisingly ordinary, considering that the class 3 students know exactly how the curse plays out before the solution was found in the tape revelation. All of those horrors must had made them forgot that any given problem can be solved if the source of the problem is dealt with. The solution, while is surprisingly intuitive, is very hard to pull off though. This issue could only be a positive for this anime if it has a second season. The way the culprit was outed can do a lot of work, and this issue is almost an anomaly considering how the rest of the storyline was presented. The writer tried too hard to conceal the culprit’s identity by blocking the 4th wall as vital scenes and dialogues was presented to the main male protagonist but not to the viewers. Then, flashbacks are used at the end of the series to finally reveal those information to the audience, not as clues to find out who the culprit is, but as evidence for the guilt of the culprit. This is the complete opposite of the ‘my-cousin-is-not-my-cousin’ revelation earlier in the series that was brilliantly presented. The writer should have attempted to hide the secret right in the open, betting that his or her cards will not be flipped over too early unlike what happened in Dragon Crisis! because after all, the culprit has quite a lot of airtime and yet isn’t detected before the culprit’s time is up. As I mentioned above, this series is one of the very rare titles in the ‘supernatural-minus-superpowers’ horror genre in anime out there. This means that human characters in this anime will have to deal wit a supernatural being without any divine help at all. The closest thing this anime has to a superpower element is the Kara no Kyoukai-esque eye that the main female protagonist has, and this plot device turned out to be hugely instrumental at executing the solution to end the curse. It would have been better if the concealed information is used to track the identity of the culprit instead of using the eye to do so. This anime got the presentation aspect just right, with its slow pacing fitting the subdued mood as people starts dropping like flies, and the pacing increased nicely at the ending arc as more people dies left and right. I want to say the same thing too about the flow of the storyline, but while the flow in the story preceding the ending arc is smooth, I cannot say the same thing about the flow of the ending arc itself. The ending arc has a couple of minor scene transition problems, probably caused by the faster pacing and also because of the parallel plots that is running simultaneously during the ending. Character developments in this anime really take a backseat at the end of the bus in this hugely story-driven title. This is partly the fault of the effects of the curse itself, the huge amount of characters in this anime and also the overall storyline. All of the characters are there purely as a vehicle for the storytelling process, and this holds true especially for the main female protagonist. The final two or three episodes that make up the Battle Royale-esque ending is a total departure to the relatively languid nature of previous episodes, and this is a good thing as the curse was finally stopped by one of the main protagonists. But in keeping to the traditions of general Japanese horror genre, there certainly is room for a second season, with new characters for sure, because the curse will still be repeated in the new school season. Quoted For Truth! 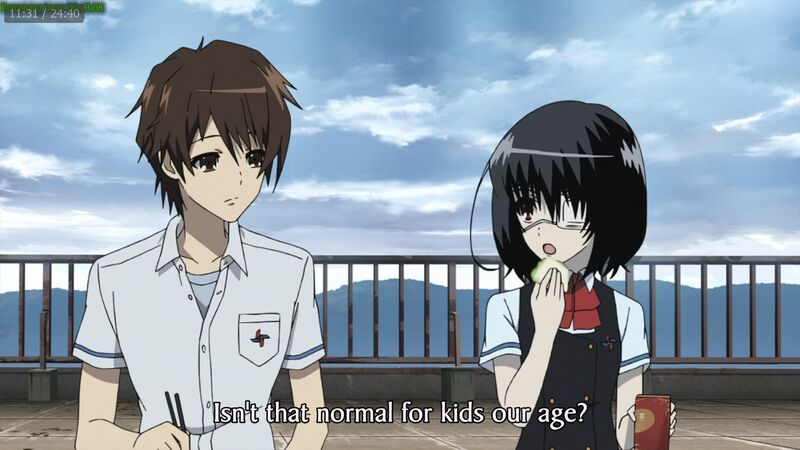 This anime surely can relate to this quote. Character designs in this horror anime is just ordinary in general. Normally, this will count as a negative aspect but not so for this anime because of the setting of the storyline that takes place in 90s’ Japan and also the storyline. This is yet another anime where brown is the new black, although the main female protagonist has black hair. I bet the blonde guy dyed his hair though. Just like the previous entry in the audition, this anime is also a dialogue-heavy anime. But when these two titles are compared in this aspect, Daily Lives of High School Boys edged ahead of this anime in terms of overall quality. I can safely say that ALL characters in this anime (and there are plenty of them) only has average voice acting performance. All of them are bland, and there is no one outstanding in the whole roster. This aspect is another element of this anime where it fails to outperform its rival in this audition. There is nothing at all that goes right for this anime musically. A horror anime like this one could have benefited from a great ambience soundtrack, but unfortunately it doesn’t get one. 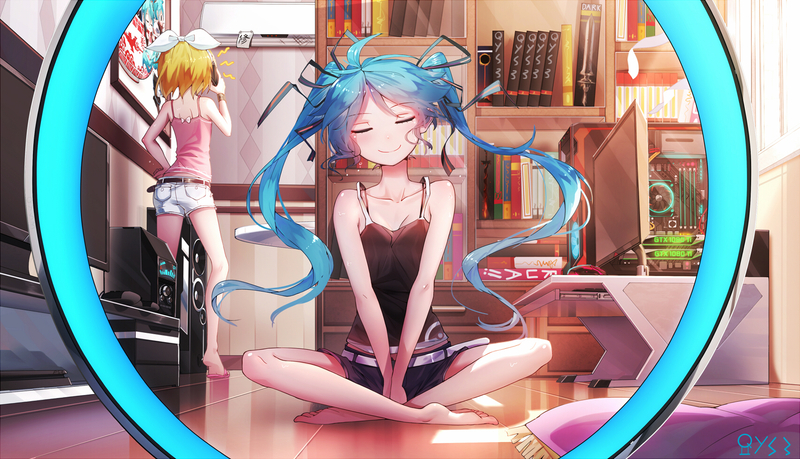 The less said about the awful ED theme and the meh OP theme, the better. This aspect is definitely where this anime has done better compared to the first entry in the audition. The animation quality in this anime is good, even in fast-paced scenes. This anime also take a page from Princess Lover and used beautiful pre-painted background images (see the screenshot below). It would have been nicer if they are animated. 2D and CGI animations are integrated seamlessly too. Choreography doesn’t apply here in this anime, even if there are plenty of deaths. The director has done an almost flawless job for this anime, a surprise because most of his previous works consists of comedy skits. THIS ANIME HAS REALLY FEW COMEDY SCENES IN IT. The static pre-painted background style seen in Princess Lover is also common in this anime. The only moving parts in this scene is the birds. The clouds are static.